There is a global crisis for clean water. Environment, political oppression, violent tribalism, and economic instability are but a few of the conditions and causes. This affects poorer people and nations where infrastructure is lacking even in large cities much less in geographically isolated communities. Lest we falsely imagine this is a problem for people outside the US, poor well water and increasingly dangerous drought conditions from shifting weather patterns are creating serious economic issues and forcing people to make uncomfortable lifestyle changes. Water is like gold is some parts of the world and more valuable than anything the digital trading of billions on Wall Street could offer. Clean water shortage is a trauma and needs traumatic intervention and care. Amyotrophic lateral sclerosis (ALS) is also a health trauma even if it affects fewer people. People began dumping clean ice water on their heads largely to raise awareness and money for ALS or Lou Gehrig’s Disease. It went viral. As of Tuesday, August 26, The ALS Association has received $88.5 million in donations compared to $2.6 million during the same time period last year (July 29 to August 26). These donations have come from existing donors and 1.9 million new donors to The Association, which is incredibly grateful for this tremendous outpouring of support (ALSA). Some are now getting tired of the challenge and would rather not see any more people with ice buckets parading through their various social media feeds. For many, ALS is becoming associated with annoyance. Many who recognize the high value of clean water for millions of people in the world are critiquing the challenge. 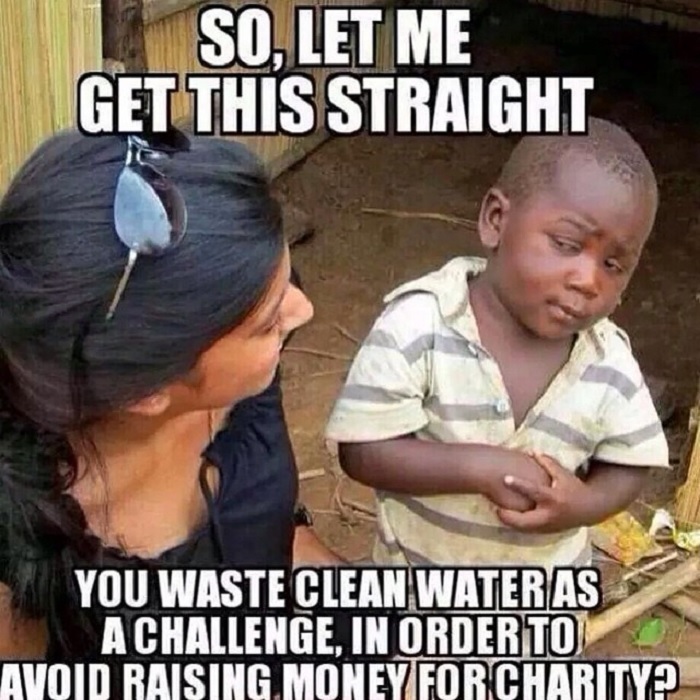 I am glad that the ice bucket as a symbol of charity has raised this conversation. It has also raised the discussion of what it means to be charitable. Why do we need gimmicks to raise awareness of different problems in the world? Why do many detach the gimmick from its referent charity just to feed their own popularity or to relieve their irrational fear of missing out? 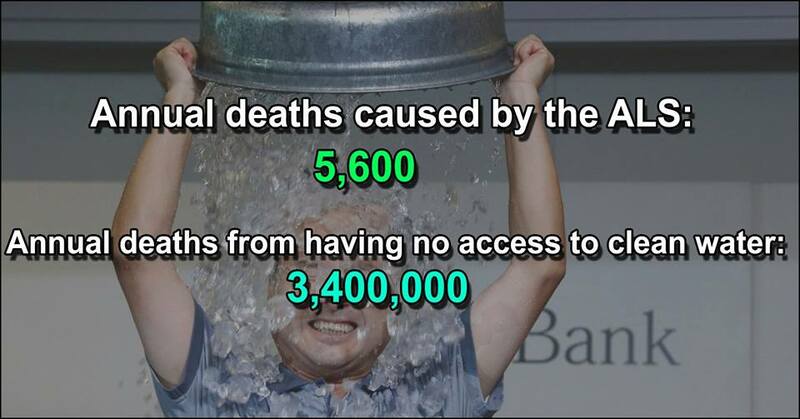 Indeed, the ice bucket has caused us to question morality and mortality in ways that far outstretch the impetus: raising awareness and research funding for a horrific disease. I can understand why a water depleted community would take serious offense to so many buckets of water wasted for all to see. Try spending an entire day, outside, without drinking a single glass of water. It’s simply terrible if not life threatening. Yet pregnant mothers and babies do it every day. Nevertheless, the bucket is not the problem. It is a symbol. If many of the people now criticizing the symbol of the bucket of water as something offensive to those who have none would calculate the gallons of water they needlessly flushed away to transport urine to the sewer, there might be a case. 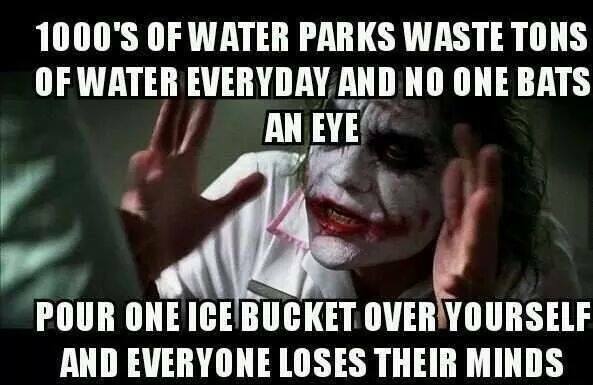 The gallons used at public pools for leisure, golf courses, athletic fields, water parks, dishwashers, laundromats, and carwashes are innumerably more than the collection of all ice buckets that have been and ever will be dumped. Yet we discuss none of these conveniences or the resistance to let all of it go in order to support world clean water shortages. What we cannot do is devalue the symbol of one act of charity in order to raise the value of another. If comparing the human lives lost is the foundation of our critique, we are no longer talking about water, but competing ideologies. Sabotaging one charity for the sake of another is a deceptive set of behaviors that devalues charity itself by filling it with guilt. Rather than reinforce a good intention, we demean it because it is not the right behavior. We force the giver into making a commitment to competing interests. The first act of charity one can give is often fraught with anxiety because it requires losing something one has. The best way to ensure another act does not happen again is to negatively reinforce it. Damned if you do and damned if you don’t as the saying goes. Charity becomes a zero sum game and the logical outcome is that neither the giver nor the receiver wins. We need more cooperation than competition. Please, use someone else’s strategy to support a cause in order to bring awareness to your own. But work together on the world’s problems. Don’t empty powerful symbols of meaning in the process. Once drained of meaning, the ice bucket becomes just that and speaks for no cause. Symbols can serve as legacies in a saga filled with greater resources of hope when more contribute to the greater good. If you are interested in helping to support initiatives for clean water, water.org is one place to get you started. For more domestic issues see the Water Blues, Clean Solutions site and watch the film if you can. To donate for ALS or offer other support, go to the ALS Association. Also, watch my challenge that I dedicate to my grandmother who died of ALS just a few years after being diagnosed.